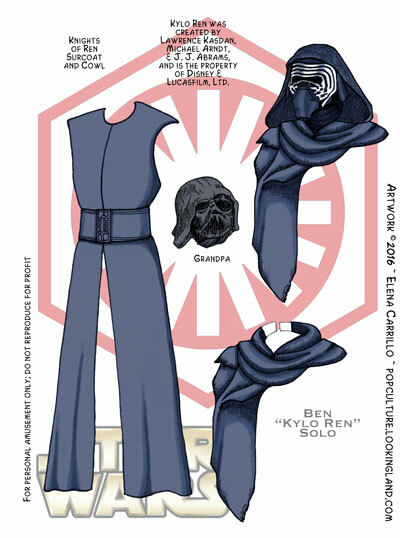 Here is the rest of Kylo Ren’s costume, as promised. Just what you always wanted: more black! 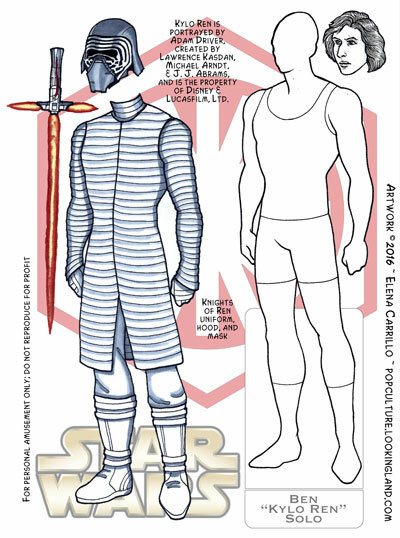 I wasn’t crazy about Kylo Ren’s design when I first saw an image of him before the movie came out. I referred to him as the Darth Vader wanna-be in the little black dress. But I have really come to appreciate this costume for a lot of reasons and now I’m disappointed with how they have altered it for the the next film! Hopefully the changes will grow on me. And even though I know this mask is now not long for the galaxy, and still think it looks like a puffin for some reason, I’d really grown to love it. All things pass. But I still love this character! I know people have a problem with him because he’s “evil”, and killed his father and all that. But I think he might surprise us in this sequel trilogy. I’m counting on Lucasfilm to not allow our original heroes to go down with this messed up kid as their legacy. That can’t happen. It would be completely un-Star Warsy. Not to mention the mere fact of poor Leia: she already lost her home planet, her place in the Senate, her husband. She shouldn’t have to lose her son! That’s just unacceptable as far as I’m concerned! And so yes, I included his real name on his base because I don’t care what anyone says: Ben Solo is still in there! I provided two options for the cowl and added Grandpa to fill out the plate. I really like the way the helmet/cowl combo came out. I’m impressed I got it done since I’m not very good at drawing these sorts of things. The helmet (Ren’s, not Vader’s) was the last piece I had to draw and technically I drew it in 2017, so I could have changed the date on this plate. But the rest of it had been sitting around so long, I just left it. And actually, the Darth Vader helmet was drawn 2015, if you can believe it. I drew it over the Christmas holiday after The Force Awakens opened. 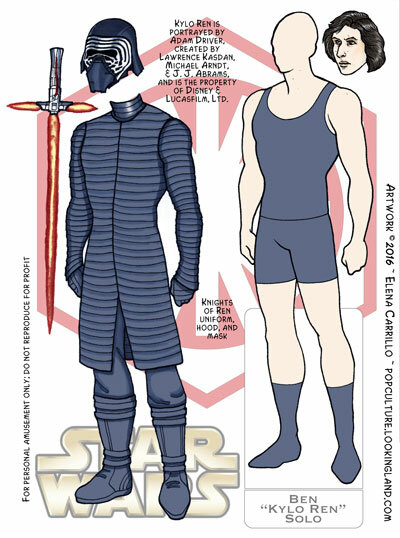 Kylo Ren is the first villain character I’ve posted for my Star Wars paper dolls. It just occurred to me because everyone else has a blue Rebel Alliance or Resistance logo background. Ren has a red First Order logo. But Ren won’t be all alone for long. After many months, I finally managed to send some fully-assembled, hand-colored Hux and Ren paper dolls to a friend in Germany who originally wanted a Hux, so I can finally post these here! Having done a proof of concept for these, I am proud to say they assemble very nicely (wish I had taken pictures!). And yes, these plates are dated 2016 because they’ve been done since long long ago. 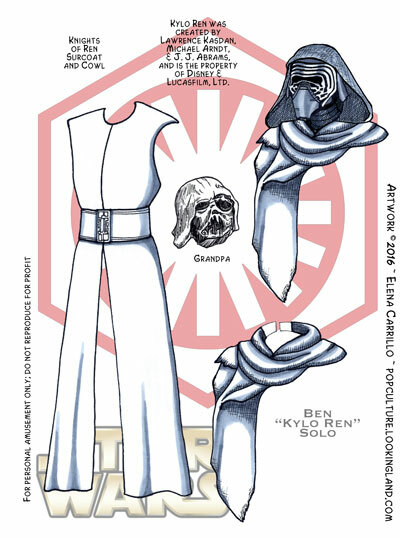 Because I drew all the layers of Kylo Ren’s costume, he didn’t fit on a single page. To be fair, they show him in all these unique individual layers in the film, so I wasn’t just being extreme for the sake of it here. An all-black paper doll is a rough proposition. You can’t use pure black because you’ll lose the detail, but a median between too dark and too light is a challenge. With Ren, I probably went too light, but I figured it would save ink if you were going to print. The charcoal-ish color suggests black well enough. For a character like this, it almost makes more sense to just print out the black and white one and do your own coloring. But here you have options, regardless. One of the interesting things about Kylo Ren’s costume is how concealing it is. He doesn’t show a smidge of skin. And even after the helmet comes off, everything about him is covered. Part of that is to shroud him (literally) in menace and mystery, but it’s also strangely monkish. Adam Driver is a big man and yet the costume hides his physique. And all those layers just add to the notion that this incredibly powerful individual swaths himself up against his own insecurity. I really struggled with this one a lot because it wasn’t easy to draw Adam Driver’s unusual face. At some point last summer I just settled for what I could manage. Before posting, I considered whether to make one last attempt, but he matches the other Star Wars characters. If I tried to draw him again now, I fear he’d stand out stylistically. It’s hard to go back to a series once I’ve abandoned it for exactly this reason. You would think a style I have used my whole life wouldn’t change dramatically, but it does for some reason. Even now I look at the whole Star Wars series and think: man I wish I had done that differently. Ah well. It is what it is. Some notes: the helmet wont go over the head (because of the hair). It’s best to leave the head options loose and interchangeable. The second plate includes his surcoat and cowl, so if you prefer the helmet and cowl, that’s a different look you can give him. Tomorrow, I’ll post that second plate. paper dolls. Because it amuses me.